Rats. What's up with me lately? I filter through my newest photographs only to discover they are not what I thought at all. This one's too bright. This one's out of focus. This one - well, it was supposed to be a red flower, not a pink one. It seems I'm all out of whack. My photography has become negative. I go out wondering if my next efforts will be any better than my current ones. Depressing huh? Well, just to prove how out of whack I currently am, or maybe instead how my brain wanders at times, this got me thinking about the negative side of a photograph. Specifically, negative space. Of course, it was spurned too by Nathanial Smalley's excellent photograph of a Sandhill Crane. Now, Sandhill Cranes are normally elegant birds. Standing some four to five feet tall, they stride across open areas, slowly placing each footstep, constantly casting a wary eye for humans and predators. Yet his photograph painted them in a more humorous light. Why? What makes his photograph so amusing? That he included so little of the bird itself. The greater portion of his photograph is actually what isn't there (the green area). This is called negative space. Conversely, the "positive space" would be the bird's head. However, in reality, the bird's head uses up very little of the photograph. Proper use of the negative area in a photograph draws attention to the main subject matter. Ask yourself what you want the viewer to see and what you want them to ignore. Proper use also means using the rules of composition correctly. Notice how the bird's head is in the lower right-hand corner and at an angle. This is far more effective than if it had been placed in the center. Here's another example. I took this shot using white poster board and an in-camera flash. (Sepia tones were created in post-edit.) 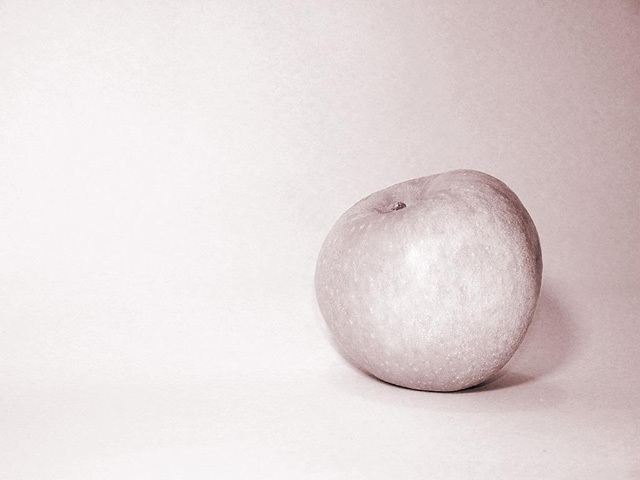 By putting the apple to one side, I left the image with mostly negative space and gave the viewer a better feel for the size and shape of the fruit. Example. Think of those camera photo pictures you take of some ginormous food item. Say, the waitress sets this massive baked potato in front of you, so you in your zeal snap a shot of it and whiz the photo off to Facebook. (My daughter had this happen. Where in heaven's name they grew a potato that large is beyond me.) Yet to everyone else, it looks like an average-sized potato, so they don't comment and you get nonplussed. Another example. Think of the I-caught-a-large-fish photo your brother just posted. You see that image and say, "Nooooo. It wasn't that large. He's exaggerating." But why then does it look like it was? Distance and scale. By holding the fish closer to the lens, it takes on an unusual proportion. Both examples (the potato and the fish) would have benefited with more negative space. There is another issue with negative space. Motion. Now, the apple wasn't moving. But let's pretend it was. With moving objects, ninety-nine percent of the time negative space must be created in the direction the object is moving into. This is similar to watching where you're going verses watching where you've been. In a still photograph (which technically, all photographs are still, otherwise they'd be video) the viewer needs to know where the apple falls, not where it fell already. "Okay, Suzanne, I need another example." Well, pulling from my vast library of moving object images (tongue-in-cheek) I found this photograph of a young Leopard Frog about to leap. (Aren't all frogs about to leap?) By putting the negative space in front of the frog, I give him somewhere to land. I also give him a better size reference (the giant baked potato now looks HUGE). But what if in an image I don't have much negative space at all? Well, think of it this way. Sometimes in busier photographs, the more non-essential elements become the negative space. Here's another example. The two water lily blossoms in this next image are the main focus, the multitude of leaves the negative space. I placed the flowers to the right and used the leaves to give them scale. You can see how large they were in reference to each other and to the lily pads. Bird photography often benefits by giving the bird more space. Crop the shot too close and I can't tell if the bird if two inches tall or six. I like to say objects need space to breathe. Who wants to go to sleep at night with one foot to lie in, a brick wall on one side (or your spouse, in other words), and a cliff on the other (the drop off to the floor)? Similarly, that bird, that giant potato, and your brother's fish would benefit with more breathing room. So, okay, my life is not all negative. Several good things are happening in it right now, and there are others on the horizon. Nor am I particularly worried about my current slump. I have missed more butterflies this year than I have captured, yet I have enjoyed at least seeing them flit through the garden. Half the pleasure is in the sighting anyhow. I will pick up and move on. And eventually, my mind will wander off on some tangent, and I'll have yet another thing to write to you.